When you need damage from emergencies like flooding, roof leaks, or sewage backups dealt with quickly, the water damage professionals in Baltimore from 911 Restoration are ready to lend you a hand. Water damage occurs when you least expect it. That’s why we’re available 24/7/365 to handle your concerns as they happen. When you call, you can expect same day service from us so you can relax knowing your problems are being handled promptly. Our industry-leading response time within 45-minutes plus our Fresh Start attitude allows us to give you premium restoration services and peace of mind. We will begin our work by providing a free assessment of your property. This will help us identify the source of your property damage so we can provide you with the right solutions. If your home or business location is already suffering from any kind of crisis, then contact our experts with 911 Restoration in Baltimore today! Don’t wait to begin your Fresh Start. Our team has years of experience in dealing with all kinds of water emergencies. With our know-how and training, we’ll make sure that you get the assistance you need. As water damage situations occur, those are going to need immediate attention in order to prevent any further harm to your home like mold growth, wood rot, or flooding. Our IICRC certified technicians make use of advanced drying equipment for efficient water extraction and top quality water damage repair and restoration. In addition, they will walk through every step of the water restoration process with you from start to finish. Don’t let your home suffer from water damage without help. Contact our water damage restoration experts with 911 Restoration of Baltimore for the best in services today! Winter is knocking on everyone’s door which means new weather conditions to prepare for. Colder temperatures bring the potential for frozen pipes. Frozen pipes keep the water within from flowing like it’s supposed to. When this happens, the pressure keeps building until they burst. 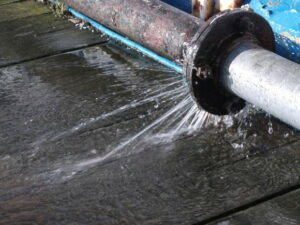 Once you have burst pipes problems like flooded basements become a reality due to the sheer water damage that occurs. The most dangerous thing about water damage in winter is the potential for refreezing. When water is allowed to freeze back over, it will just sit there until it melts again causing repeated water damage problems. This is why ice dams are so serious. To minimize the effects of water damage in winter, you need a professional restoration crew like our team at 911 Restoration to take care of your pipes and any flooding that happens. Water damage is a serious problem no matter what time of year it is. If you’re at risk of frozen pipes or already experiencing flooding, then don’t wait to call our crew at 911 Restoration. 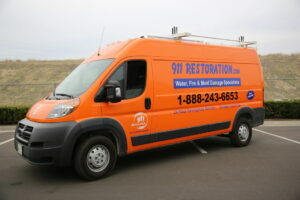 They are fully trained and qualified to handle all winter restoration needs and will fix any water damage that occurs. When excess moisture from water damage like roof leaks and burst pipes cause mold growth, you need that fungus removed right away. Mold can cause wooden sections of your home to deteriorate faster and spores can cause health conditions like skin allergies, asthma, and coughing. With our state-of-the-art equipment and thorough drying solutions, water damage and mold growth don’t stand a chance! We’ll get your home back to pristine shape in no time, so give our mold removal team with 911 Restoration of Baltimore a call today! A sewage backup occurs whenever pressure builds up in the city’s sewer system. The pressure causes sewage water to rise up into your home through a toilet. In addition, frozen pipes can cause a sewage backup due to the waste not traveling properly. When black water gets into your home, you’re going to need the immediate response from 911 Restoration of Baltimore. Black water is filled with bacteria that can spread all sorts of disease. It also can damage your walls, floors, and carpets. 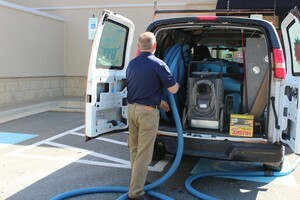 The expert team from 911 Restoration has the necessary equipment to deal with major problems like sewage backups. Due to the hazardous nature of sewage, our technicians will be wearing protective hazmat suits to ensure proper protection while handling your sewage cleanup. We will be extracting sewage water with our advanced equipment and we will be using industrial strength cleaning solutions. This will disinfect the area without causing any further harm to your home. Once the area has been cleared, our team can begin the restorations that will give you and your home a Fresh Start. If you’re already amid a category three water exposure event then contact our sewage backup cleanup team with 911 Restoration of Baltimore today! We know how difficult it can be to deal with the damage from a fire. That’s why we want our services to be as convenient as possible for you. Plus, we are fully qualified to assist you with any water damage experienced from putting out the fire. Aside from our thorough restorations, we will also help you file your claim with your insurance company. If your property has recently been through a fire or smoke event of any size, then you need the support of our fire and smoke damage restoration team with 911 Restoration of Baltimore today! Nature brings strong winds, heavy rains, snow and ice, and other natural disasters. All of these contribute to water damage, fires, mold, and more. When your home has suffered from a disaster, you need to call 911 Restoration right away. We know that disasters can often occur when you least expect them that’s why we’re always good to go whenever you call. Our water damage specialists in Baltimore can provide comprehensive repairs and restorations. They will handle any damage caused by a storm or other disaster. With our help, you can count on your home getting back in shape in no time. With our breadth of experience, quick response, and advanced equipment, we’ll make sure that water damage, sewage backups, mold growth, fire damage, and disaster damage are taken care of. Our disaster restoration technicians in Baltimore can provide the highest quality of restorations that will give your home a Fresh Start today!